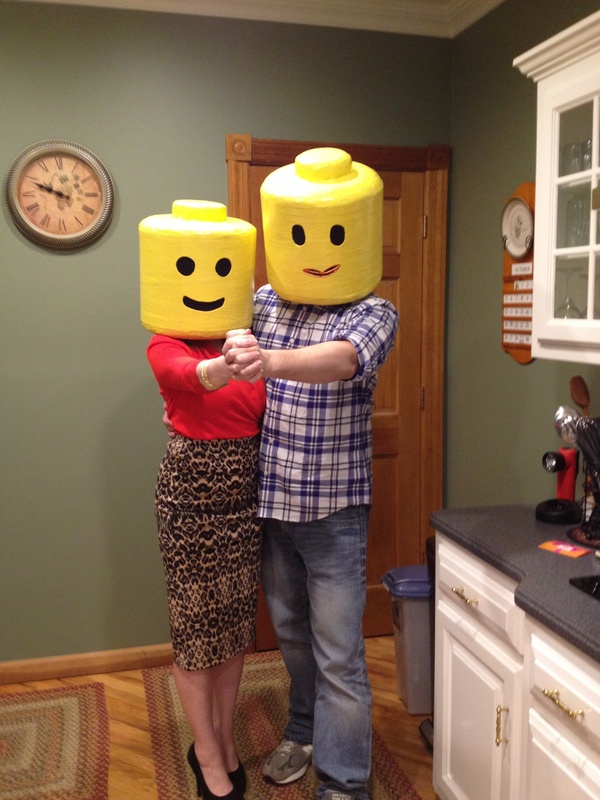 Somehow, in between researching pumpkin carving templates and snacking on Munchies, we stumbled upon an amazing DIY costume idea: Lego Man and Woman Costume. I believe it took us about fifteen minutes to agree on the idea and arrive at the Home Depot for supplies. 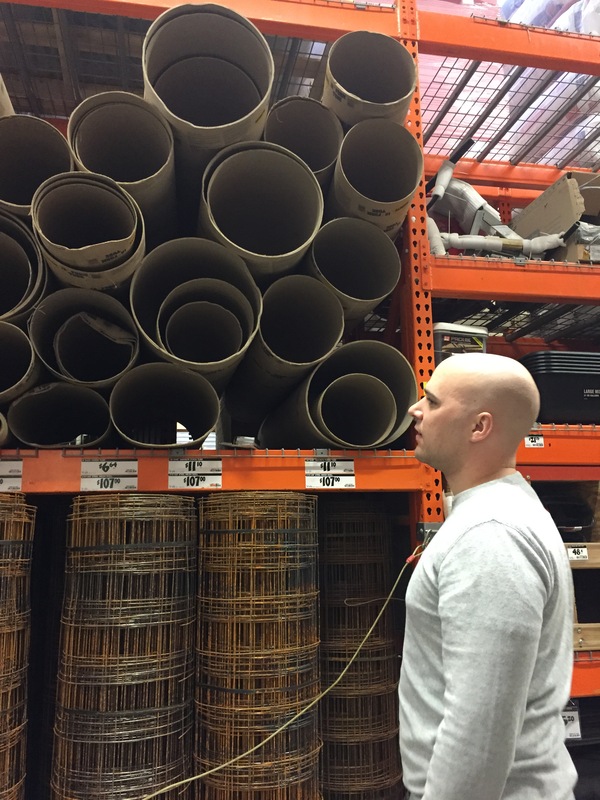 First, we headed to the construction aisles for cement tubing and insulation. 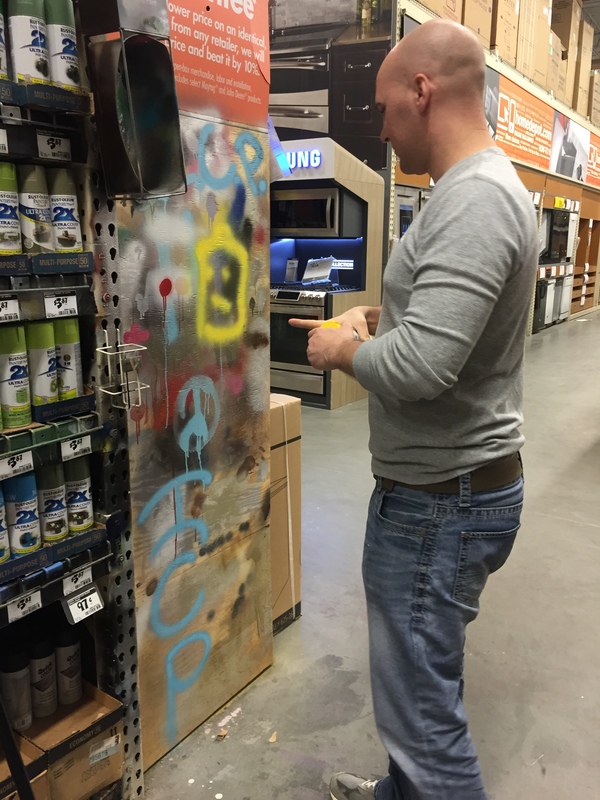 Then to the paint aisles for spray paint. Brian tested the color on the graffiti board to ensure it was the perfect shade of Lego yellow. Of course, we left a fitting image behind. Then, along with the precise assistance of an electric meat carving knife (who would have thought? ), the cutting commenced. 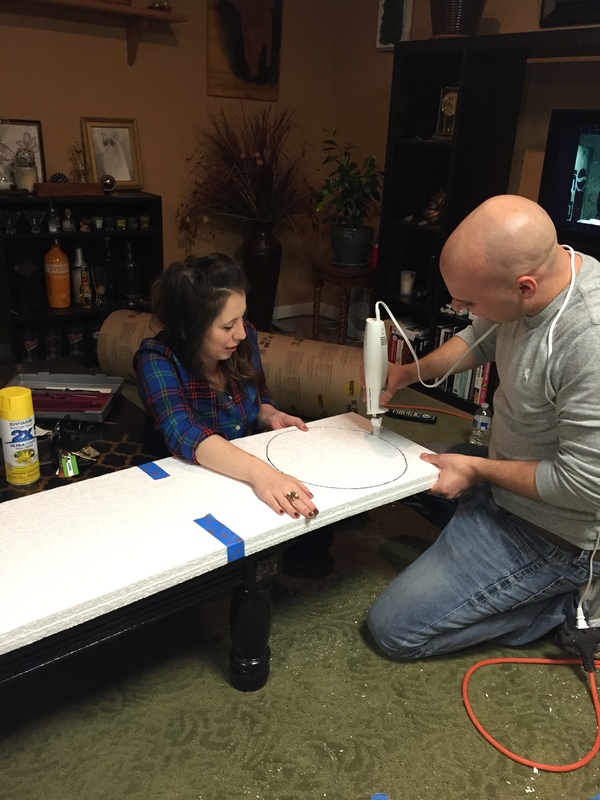 We double layered the insulation to expedite the process and cut four large circles through it. These will serve as the top of both costume heads. We then cut six smaller circles for the peak. Then, we measured our heads from top to chin. It was a bit time consuming to mark measurements around the tube, but it’s important to have a straight line so patience is required. We utilized a tape measure for this and then cut the cement tubing accordingly. With a hot glue gun and many, many glue sticks, we began connecting all pieces together to complete the head. Once it dried, we tested it out. From here, Brian took control to finish off the project. First, he painted the heads. Next, he stretched out and glued black pantyhose behind the openings of the eyes and mouth, giving a black hole effect. 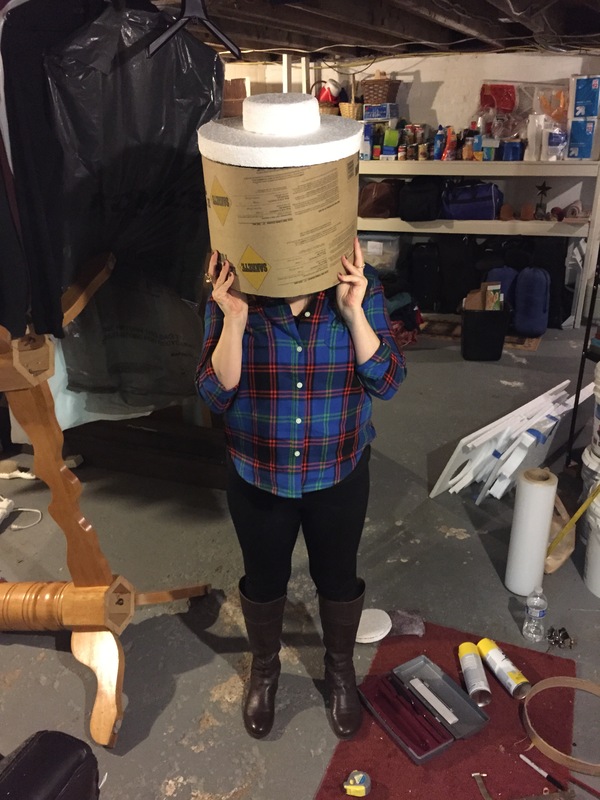 Later that night, we both fitted our heads, adding additional pieces of insulation to the interior which would provide a comfortable cushion. Then, we tangoed around the kitchen. With the help of his brother, Kenny, added touches were placed on the Lego Woman’s head, adding eyebrows and red paint to the lips. Finally, Lego Woman looked like a woman and not a mustache-wearing Frenchman. 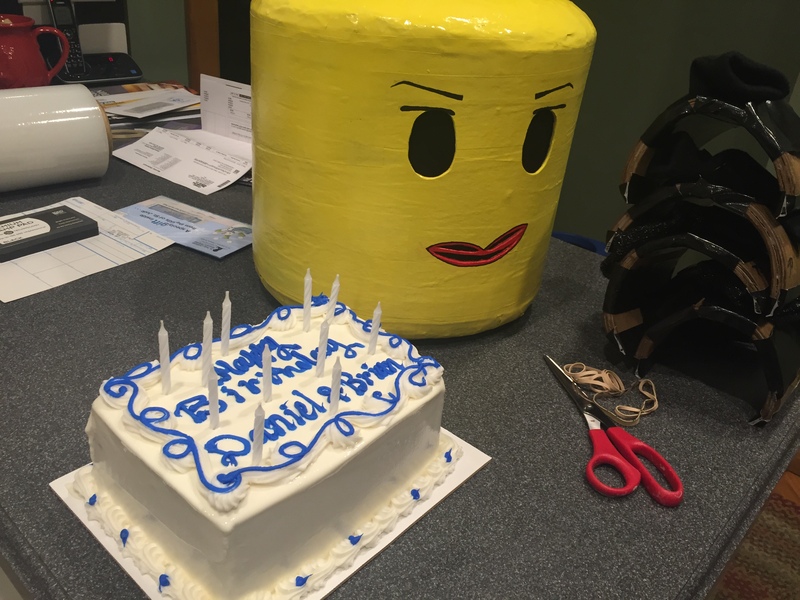 Click here to see the finished product and read about our adventure as Lego people!